The Tesla Roadster that hitched a ride into orbit on SpaceX's Falcon Heavy rocket in February has journeyed beyond the red planet, the company said Friday in a tweet. The cherry red convertible and its spacesuit-clad mannequin driver, dubbed Starman after the 1972 Dave Bowie song, have driven beyond Mars. 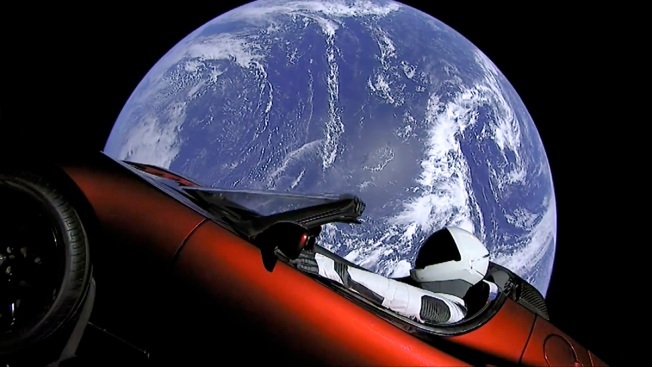 SpaceX tweeted a photo of Starman's location along with the caption, "Next stop, the restaurant at the end of the universe," a reference to the second book in the "The Hitchhiker's Guide to the Galaxy" series written by Douglas Adams. The car's current trajectory will take it into the asteroid belt in its planned orbit around the sun, according to a diagram tweeted by SpaceX CEO Elon Musk earlier this year. But scientists say it is unlikely the car will encounter anything beyond ultraviolet radiation, cosmic rays, other highly charged particles or an occasional micrometeoroid. As a result, ongoing exposure to UV light will cause the car's paint to fade over time, just as cars here on Earth do. Starman and the Tesla have been on a steady course away from Earth since they were included as the payload during a successful test of SpaceX's rocket designed to hoist satellites and equipment into space. Musk, who owns both SpaceX and Tesla, included the vehicle in the launch as a "silly and fun" way to bring attention to his companies' accomplishments.